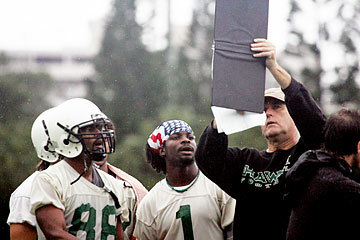 UH football coach June Jones went over offensive plays during spring practice this week. An annoyance to some, the rain drenching the Hawaii football practice field this week doesn't bother Jason Ferguson one bit. "Everybody was complaining it was raining today," Ferguson said after drying off after the first spring workout Tuesday, "but I missed being out there in the rain. Just being at practice is cool." The 5-foot-5 junior receiver won't be running patterns during spring drills as he continues his recovery from knee surgery. But he's savoring being back with the Warriors on the practice field. "I'll be on the sideline talking it up and having a good time just being back in this environment," he said. Ferguson earned a starting job as a slotback last fall. But what was supposed to be a breakout year ended abruptly when he suffered a torn ACL while returning the opening kickoff of the season against USC. He returned home to Los Angeles to have surgery and had to stay off his feet for close to two months. "It's probably one of the most mentally tough things I've had to go through," he said. "A lot of stuff is going to come in my life I know I'm going to have to deal with, but so far that's been one of the most tough things I've had to do." Ferguson watched the handful of UH games televised on the mainland last season, and although he couldn't be on the field, Ferguson found gratification in the success of his summer roommates, freshmen Davone Bess and Ryan Grice-Mullen, who thrived in UH's run-and-shoot offense. "We all trained so hard for the season, so to see the type of seasons they had, that definitely made me feel good," he said. "And it gave me confidence that we did the right thing. We trained hard and it paid off so much for them." Ferguson said he recently began working on a stationary bike to start building his cardiovascular endurance and he'll start doing some light agility drills when he gets a knee brace this week. Once he gets back into playing shape, Ferguson knows he'll face a lot of competition to get back into the lineup with UH's starting slots returning to one of the nation's top passing offenses. "There's definitely going to be competition, but I'm just trying to play," he said. "Whether I start or not, I'm trying to get on the field." Samson in study hall: UH's most highly regarded offensive lineman and probable new starting center did not attend the first two practices of spring camp. Senior Samson Satele is among the Warriors who need to get up to speed academically before coach June Jones will allow them to practice. "When he gets his stuff taken care of inside, he will be out here," Jones said. Satele, who has received all-conference notice in every one of his three seasons at UH, is expected to start at center this year after playing left guard most of his career. Satele considered making himself available for the upcoming NFL Draft, but decided to remain at UH. Freshmen Aaron Kia and John Estes have taken the reps at center in Satele's absence. Around the corner: With the top tiers of last year's cornerback rotation moving on, junior A.J. Martinez and sophomore Guyton Galdeira have been working with the first unit early in spring drills. "Right now it's an open audition," Martinez said. "Whoever wants it, whoever's the best at it is going to play." Martinez, who can cover 40 yards in 4.41 seconds, played receiver and safety last year and also returned kickoffs. Galdeira recorded four tackles in eight games as a freshman. The current UH corners hope to use the spring to impress the coaches, as the Warriors signed nine defensive backs, including four junior-college transfers, who are expected to compete at cornerback or safety in the fall. Senior Kenny Patton started at corner most of last season, but is trying out at receiver this spring. Keao Monteilh and Ryan Keomaka also started some games last year, but have been dismissed, at least temporarily, for school deficiencies. Freshman JoPierre Davis was slated to get a long look this spring, but won't be able to practice until he completes academic obligations. » Brashton Satele has "The Hunger"